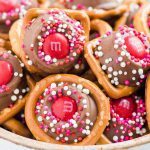 These Rolo Pretzels with M&M Candies are a family favorite! Everyone will enjoy this fun, and easy Christmas treat. These are always such a huge hit around the holiday season. Line a baking sheet with a Silpat and arrange the pretzels onto your baking sheet. Once you have all of the pretzels nicely placed onto your baking sheet a rolo on top of each pretzel, you can also use Hershey kisses if you like. Bake the pretzels with rolos in a preheated oven for 4-5 minutes, just until the rolo chocolate candy starts to melt. Remove the pretzels from the oven and place an m&m candy onto each pretzel and lightly press it in. Top with desired sprinkles or leave as is. Let the chocolate cool completely before enjoying. Be sure to use fresh pretzels and rolos. You don't want stale pretzels or rolos that are too tough, and we always get the holiday rolos. Don't overcook the pretzels and chocolate. It should only cook in a preheated oven for at most 5 minutes, otherwise, you risk a chocolatey caramel mess. Easily adapt this recipe with holiday candies and sprinkles for any holiday. Swap out the colors and even flavors of the m&ms for more festive fun. It can take a while for the chocolate pretzels to cool, you can speed the process up by placing in the refrigerator if you're in a rush.